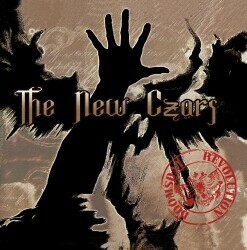 The New Czars are a heavy prog Euro-American rock group assembling the talents of singer/songwriter/guitarist Greg Hampton and drummer David Moreno, with former Pink and Juliette & The Licks bass player Paul Ill. Rounding out the sound are sonic contributions by sax/keyboardist Steffen Presley, and King Crimson guitar whiz Adrian Belew. Doomsday Revolution loosely resembles a Todd Rundgren project, with it’s multi-layered big studio sound offset by a mixture of basic pop rock sensibilities. The songs are quite a lot to absorb in a single sitting. To say there’s a ton of ideas at play in these 16 tracks would be a massive understatement. To illustrate this point: “Don’t Watch Me” features a modern processed guitar workout and intense vocal delivery. It’s beautiful contradiction is the marriage of technological studio sounds with raw primitive emotion. “Brush With The Devil” etches a gothic metal streak into a club-style dance beat. Some of my favorite moments are the instrumentals colored by Hampton and Belew’s stylistic soloing. “Abstract Prague” may have the most overt Crimson influence, via Belew’s signature overdriven free-flight guitar genius. The “Funky Detour”/”Crotch Critters” opus displays stretched out jamming, with the two guitarists intertwining their effects laden fretwork.